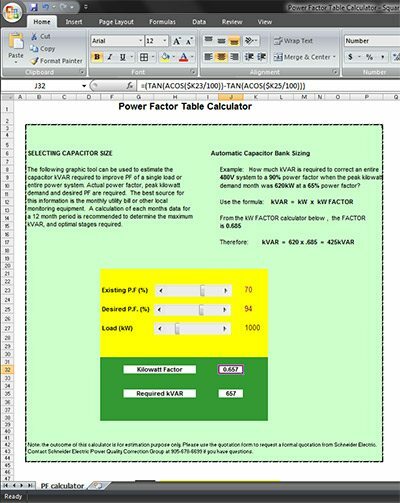 The following graphic tool can be used to estimate the capacitor kVAR required to improve power factor of a single load or entire power system. 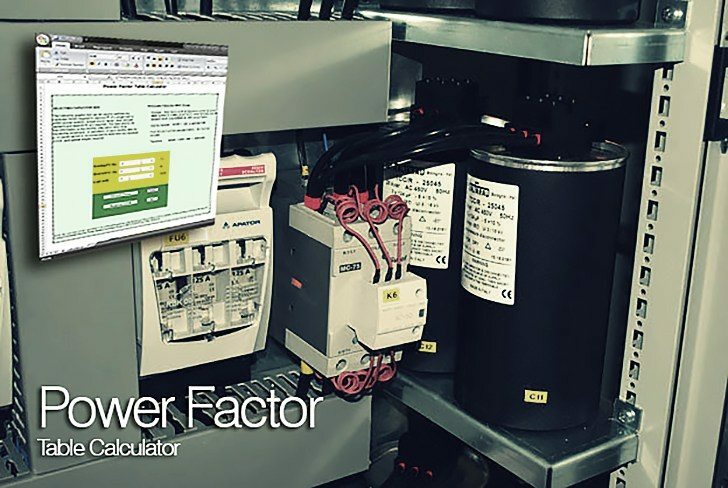 Actual power factor, peak kilowatt demand and desired power factor are required. The best source for this information is the monthly utility bill or other local monitoring equipment. A calculation of each months data for a 12 month period is recommended to determine the maximum kVAR, and optimal stages required. How much kVAR is required to correct an entire 480V system to a 90% power factor when the peak kilowatt demand month was 620kW at a 65% power factor? For PFC and for capacitor type starting of induction motors how can we calculate size of capacitor required depending on Kw & speed of motor.Are there any tables/Charts?. Nice calculations! I yet to try your sheet but I do my own calculations. Two questions arises; (1) The K VAR (capacitive) must be equal to K VAR (inductive) in power factor improvement, so shall we not to consider the total demand or connected load of the Inductive equipment in calculating K VAR out of the total demand or connected load of the entire 3-phase system??? For example the total inductive equipment’s demand load = 180 KW out of the entire demand 620 KW system must be rather taken into account? In order to have proper calculations and cost to keep to minimum and get the desire work accomplished etc. (2) Should we not consider the connected load? Or should consider only demand load…I think it should be demand load since…Please explain in length if you can?